We are proud to announce our latest updated program, which is also biggest overhaul since GoaliePro was started. We have spent the 18-19 season for development work, advanced game analysis and methodology testing. As a result, we decided to focus all our resources towards our pro program, which means that we will have very limited number of spots available for goalies. But we will be able to give the selected goalies much more than in the traditional camp setup. Below you will find the details of the program and how to apply for a possible spot. Our ice program covers June and July with 3-6 ice sessions every week. On top of ice sessions there will be personal programs for all participants and joint dryland practices. In General, your week will be 1 workout on Sunday, 2 workouts Mon-Thus and 1 in Friday leaving open recovery time for the weekends. Naturally this will vary between individuals and depending on their needs. Program takes place at Espoo, Finland. Summer is the best time to work on goaltender’s technique. In our program we are on the ice 3-6 times every week and work with personal development plan that will be created for every goalie. With this consistent approach we get the best possible results and needed repetition so that corrected / new techniques will carry to the season and become part of each goalie’s permanent toolbox. Personal development plans will be created together with the goaltenders and in many cases also with their team coaches. For example, we coordinate our program together with NCAA D1 schools coaching staffs whenever possible to guarantee as consistent instructions and coaching as possible. On the ice we will use professional and college shooters. Each ice session has max 4 goalies on the ice at the same time so that there will be only 2 goalies per net. Only ice sessions with more goalies are the early morning skating only sessions when there will be max 8 goalies. For the goalies that will be with us for the whole summer or at least 1 month on the ice, we will create personal dryland training programs for every week starting in April/May as needed. Other goalies will have personal programs for those weeks that they will skate with us. On top of that we will have several dryland sessions led by GoaliePro coaches Jukka Ropponen and/or Ale jääskeläinen. Our dryland programs are 100% tailored to individuals and goaltenders needs. This means a lot of new methods for most participants. Our program is very demanding and therefore we give all participants strict nutritional instructions to follow as otherwise they will not get the most benefits out from the program. Participants will also have access to very special priced BioSteel Sports Nutrition supplements. 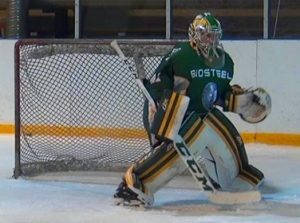 Returning GoaliePro students have priority access to the program. After that we will fill the remaining spots based on our review trying to choose the goalies we believe we can help most. Below you see the booking situation per week.